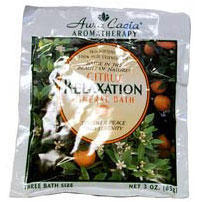 Mineral Bath Relax Citrus, contains a calming combination of essential oils and mineral bath salts. Aromatherapy. Skin Softening 100% Pure Essential Oils. Bathe in the Beauty of Nature! Discover Peace and Serenity. biodegradable. Safe for whirlpools & spas. Transport yourself to a place of peace and serenity with this blend of calming oils of lavender, ylang ylang and roman chamomile combined with the refreshing scents of orange, tangerine, lemon and bergamot in a stabilizing sandalwood base. Experience the luxury of Aura Cacia's aromatherapy mineral baths. The pure essential oils of natural botanicals offer a variety of benefits-enhancing and balancing your mind, body and spirit. Our unique blend of ocean and desert salts, generously scented with 100% pure essential oils, will give you softer feeling skin and soothe your soul. Indulge yourself and discover the benefits of Aura Cacia aromatherapy! Aura Cacia offers a choice of more than ten aromatherapy mineral baths, as well as a wide variety of other natural aromatherapy products: 100% pure essential oils and essential oil blends, body oils and soaps. Immerse yourself in the natural beauty of Aura Cacia! Website: www.auracacia.com. Sodium borate (desert salt), Sodium Chloride (sea salt), Sodium Bicarbonate (soda ash), Essential Oils (sweet orange, tangerine, lemon, bergamot (bergaptene-free), lavender, roman chamomile, ylang ylang III, sandalwood)..